(Bloomberg) -- Palestinians mock him as ‘‘the sheikh.’’ Communicating with him risks arrest. From his computer in Tel Aviv, Israeli Major Avichay Adraee has become a celebrity of sorts in the Gaza Strip, where his social media posts, sprinkled with Koranic passages, have resonated in unprecedented ways. Make no mistake: the Israeli army’s top Arabic-language spokesman isn’t a welcome presence on Gaza laptops and mobile phones. His messages, exhorting Palestinians in fluent Arabic to avoid confronting Israeli soldiers at protests, have been denounced by mosque preachers and at the highest levels of the ruling militant Hamas movement. Many Palestinians find the spectacle of an Israeli soldier sitting behind a desk, gesticulating and relying on the Koran for persuasion, to be laughable. 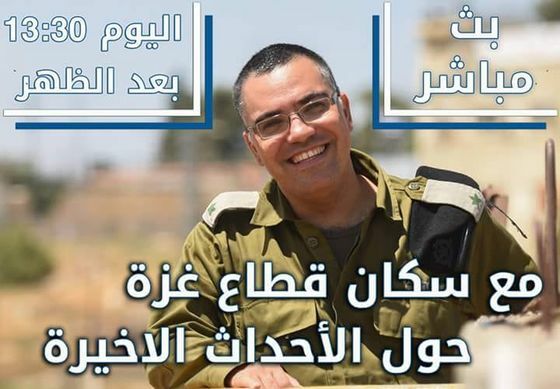 But Adraee’s reach -- he has more than 1.5 million Arabic-speaking followers on Facebook and Twitter -- has given this mid-level officer uncommon access to the people of Gaza and beyond. The extension of warfare to digital battlegrounds has required Israel’s military to intensify its cognitive operations, said Gabi Siboni, a cyber expert at the Institute for National Security Studies in Tel Aviv. It’s developed a doctrine and is adopting technologies. The Defense Ministry, along with the U.S. Defense Department, is funding a competition to find promising startups. Among the technologies under consideration is TerraVox, which mines and analyzes social media for law enforcement and emergency authorities. Israel is also expanding its use of social media, and that’s where Adraee -- a 35-year-old army intelligence veteran with family roots in Syria, Iraq and Turkey -- comes in. For the past decade, he’s headed the military’s Arab media division, a fixture of the spokesman’s office that initially delivered wartime information to the Arab press and informed Palestinians about developments like border closures. Social media has allowed the unit to go global and broadcast the military’s take on what’s happening in Palestinian territories directly to people across the Arabic-speaking world. “The idea was that if there was a person who you could curse at or request something from, or who you knew, it would be much easier to connect through some kind of feeling, not necessarily love, it could also be hatred,” Adraee said. Adraee says he’s received death threats, and on his office wall hangs a firebomb kite from Gaza bearing his name, and the Arabic word for “thug.” Gazans on social media have said the kite was launched after he faced off with a Palestinian interviewer on Al Jazeera television. The firebomb didn’t ignite. This virtual war reflects the disproportionate forces Israelis and Palestinians wield. Adraee has created “one of the most successful social media accounts that I have ever seen, and every day his followers are increasing,” said Khaled Saffi, a social media analyst in Gaza. After Gazans launched mass demonstrations against Israel in March, Adraee began invoking the passage from the Koran exhorting believers not to “throw yourself into hell” by risking bodily harm -- in this case, by confronting Israeli soldiers. Troops have killed about 120 Palestinians at the protests, which have been punctuated by violence against Israel.